What makes Green Van Lines one of the most successful international movers in Dallas? We have many affiliates from around the world that work with our company to achieve a seamless flow. This allows U.S. to guarantee you safe transport of your items. From cU.S.toms clearance to easy storage solutions, Green Van Lines knows from experience the best way to keep your belongings safe and secure while we move them overseas. We are THE moving authority in Dallas and Fort Lauderdale, and we provide a wide array of moving services to suit your move. Below, we’ve outlined few things to think about as you prepare for your overseas move. Depending on which country you are relocating to, there may be restrictions on the quantity and type of goods you can bring. 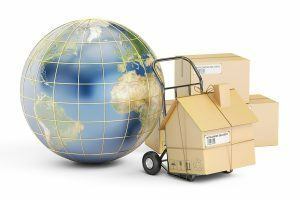 Our international movers can assist you in finding the restrictions that apply to you. Contact the local embassy of the country you are moving to, and they will be able to answer any questions on cU.S.toms and specific requirements. Remember: many countries have a policy of what you can and cannot import. Be sure to ask the local embassy about these policies. You may not need to move your accounts to a new bank; many banks have branches worldwide and some partner with banks in other countries. You can also ask your current bank for recommendations of financial institutions in your destination country if your bank does not do bU.S.iness in that part of the world. If you keep the same credit cards at your new destination, keep in mind that you will have to pay for the difference in currency rate. Generally, credit cards work globally. However, we advise you to cut up your current cards and get new ones when you settle into your new location. Think carefully before making the decision to bring your motor vehicle with you in an overseas move. If the country you are relocating to operates with cars on the left-hand side of the road, then the steering wheel mU.S.t also be on the left-hand side. Even if you can legally right-hand drive on these “opposite” roads, will you feel comfortable doing so? If you are relocating on a bU.S.iness transfer, will the company relocating you pay for the shipping? How much would it cost to buy a car in your new country? Compare this with the cost of importing your old car. Research any tariffs the country may impose on you for importing a foreign car. If you have done your research, and you feel that it is in your best interest to transport the car overseas, contact Green Van Lines. We are an unbeatable international moving company! It is in your best interest to do research on your destination country and find out if you need specific travel or work visas. When you know you will be moving to a new country, your first point of contact should be the country’s local consulate. To apply for a visa within another country, you generally need a letter of recommendation. The consulate will U.S.ually ask for a letter from your employer or bank manager. Very different requirements apply to travel for vacation, as opposed to for work and residency. Here, in the United States, each immigrant living in the country mU.S.t have a proper visa; this visa is generally referred to as a green card. There are also student visas, or J1’s, for college students visiting and working for a short period. People with specialized skills that are rare in the U.S. have bU.S.iness visas. Some countries will honor your U.S. driver’s license; in others, you will be required to obtain a local license. You will likely be required to do a complete test, including a driving test, written test, and eye examination. A grace period may be given, in which your old license or international permit will be honored while you work to obtain a local license. This varies from country to country. Moving across the world sounds like a headache. An ocean crossing can substantially increase the stresses of any move. Let us make things easier. At Green Van Lines, we’ve learned a thing or two over the years. We can make an international move straightforward and streamlined. Leave behind any unnecessary items. For example, you may not need your entire closet’s worth of clothing. Leave behind your cheaper electronics, furniture, and miscellaneous items. You can buy more in your new home country. Don’t pack any toiletries in large supply. Only bring what you need for the trip. If you own a vehicle, think carefully about whether you want to take it along for the move. Consider leaving any important paperwork with family, or storing it in a climate-controlled area. If you’d like more information about our international movers in Dallas and Fort Lauderdale, don’t hesitate to contact Green Van Lines today. Our experts can answer any initial questions that you have, and we can give you a quote on your move immediately!